Our commercial and residential deep cleaning process is a much more involved level of cleaning than our standard cleaning provides. 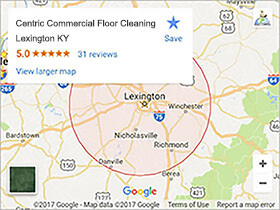 In addition to Lexington KY, we also perform our deep cleaning services in Georgetown, Frankfort, Nicholasville, Winchester and the Richmond KY areas. During our deep cleaning process we clean every nook and cranny of your home or business. Every item, every room, and every appliance gets inspected and cleaned. What is Different About Our Deep Cleaning Services? Because we have professional grade tools and equipment our process goes much further than hiring a maid service or a typical cleaning company. Our truck mounted extraction machines can clean more than Carpet Cleaning or Upholstery Cleaning; we’re able to clean above and beyond the industries standards. We can steam clean showers, tile and grout, steam clean stainless steel and counter tops, and so much more! We offer a full service solution for your cleaning needs; Centric Cleaning will have your home or business looking beautiful at the end of our deep cleaning process. When Is the Best Time For a Deep Cleaning? Before moving in: Before you move into your new place call us, we’ll come out and do our deep cleaning process. You’ll be confident that we’ve gotten the allergens and other unseen contaminates from your new home or business. 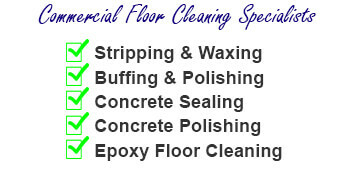 Annually at springtime: We get a lot of requests for our deep cleaning services from Lexington KY residents and business owners during the spring. With our professional equipment we can clean 3 times as deep and twice as fast as a home or business owner can. In the end this saves both time and money. And wouldn’t you rather be enjoying your spring anyway? Before an inspection: Commercial business likes to use our services to make sure that everything is in top shape before a corporate visit or grand opening. 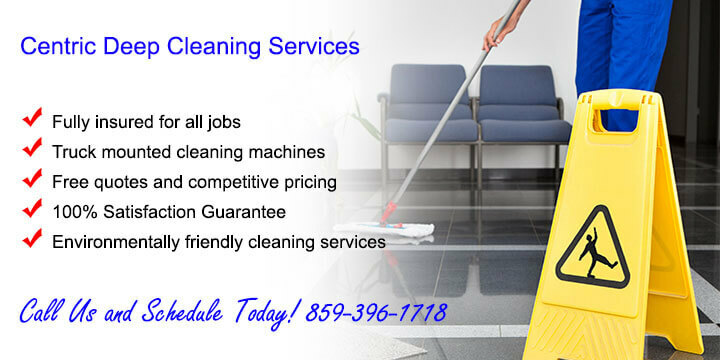 Our commercial deep cleaning services can make any Lexington based business ready to go. Before a party: Home and business owners both like having us in to do a deep cleaning before engaging guests at their homes, Or customers at their business. You only get one chance to make a first impression and we want to help you put your best foot forward. Call Us For a Free Deep Cleaning Estimate Today! Do you need a estimate for deep cleaning services? They’re easy to get. Just call us at 859-396-1718 or use our CONTACT US FORM here on our site. We set a time for you that’s convenient, and offer you fair and competitive pricing. Visit the ARCSI website to learn more about the deep cleaning process and how it can benefit you.